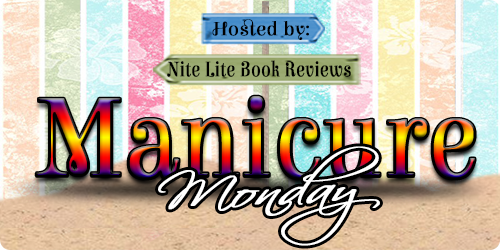 Manicure Monday is a meme hosted by Nite Lite Book Reviews. Take your current read and give yourself one fantastic manicure! .Pepper has spent years dodging the corrupt club owner who will stop at nothing to keep her silenced. She can trust no one, not even the handsome new "construction worker" who's moved in next door. The heat between them is undeniable. But will surrendering to passion bring her the safety she so desires—or will her feelings for Logan draw them both into a killer's crosshairs? Hello again! It's finally Monday! And you know what that means! MANICURES!! Oh, yeah. This weeks Mani is based off of the book RUN THE RISK by Lori Foster. It is the first book in the Love Undercover series. I am about 30% into it and... well... Let's just say it's a bit draggy for me. It's interesting, I'll give you that, but I don't think I'm a big fan of the heroine right now. She's too flip-floppy for my tastes. But Logan... Oh, Logan. That's my man candy this week. Now! On to the mani! Description: Pretty simple mani this week. Total # of polishes used: 5 -- lol yes, that's a pretty average number for me when it comes to mani's. Not to worry, one is a base coat and one is a top coat. First I a base coat to all my nails: NYX girls Nail Hardener Then I painted two coats of Wet & Wilds BLACK CREME. On top of that I added two coats of NYX Girls FAME (Purple glitter polish) and when that dried, I added one coat of NYX Girls FUNKY (light purple glitter polish). And Revlon's Quick Dry Top Coat to seal the deal. Link up below if you're joining in on this meme! Very pretty Ana. I'm terrible at chipping mine so hardly ever paint them anymore. So I'm gonna live vicariously through you! Mmmm yeah Logan was yummy. I think the heroine got to me the first part of the book too but somewhere in there she started making sense and I got why she was that way. Been so long since I've read it though I just can't remember. Darn. Hope it picks up for ya! Ermagwd, Ana!!! I love this mani!!! It's so stunning!!! I used to hate wearing glitter polish because of how hard it was to get rid of, then I found the foil trick and now I wear it at least once a week! 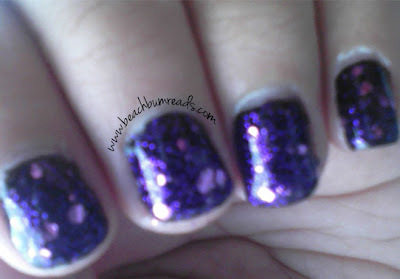 I think I NEED some purple glitter polish STAT! Freaking A girl! Those are gorgeous! i have read i think two of the books in this series before. they are usually pretty fun. and the man candy on that cover is pretty nice. love the nails this week. i am always a fan of glitter and this looks extra sparkly.